DigitalPersona is a human-proofed and frictionless enterprise authentication solution that helps companies and organizations from various industries which include financial, retail, healthcare, government and law enforcement improve their security posture and compliance by giving them the opportunity to go beyond the traditional authentication methods and options such as two-factor and multifactor authentication. Developed by Crossmatch, a leading provider of authentication and biometric identity solutions which is trusted by many organizations and agencies around the world, DigitalPersona enables users to protect their desktop computers, workflows, applications, networks, and devices while ensuring that they will be accessed by the right persons within or outside their organization in secure and convenient ways. DigitalPersona allows the application of authentication methods and options in granting access to devices and applications, whether on-premises or in the cloud, that take into account contextual and risk-based factors. These factors can include time, location, velocity, and behavior. The composite authentication software solution can be implemented for a variety of use cases such as Windows desktop and server access, addressing the loopholes and issues related to single sign-on solutions, securing cloud-based and mobile applications, strengthening access to VPN technologies, achieving compliance to CJIS or Criminal Justice Information Services security policies, and creation of custom authentication processes and methods. DigitalPersona introduces a new and modern approach in granting secure access to enterprise workflows, devices, networks, and applications. The authentication solution eliminates reliance on traditional authentication methods and options which are proven to be inadequate. Companies and organizations usually implement two-way authentication and multifactor authentication methods. However, such methods are no longer sufficient to provide users the level of security and compliance they need. This is because threats are consistently evolving. In other words, hackers, fraudsters, and malicious individuals are continuously inventing sophisticated mechanisms and methods to invade the security and privacy of companies and organizations, increasing their exposure to threats. Thus, what they need is to implement innovative authentication methods that can respond to the most sophisticated threats. DigitalPersona helps users go beyond traditional authentication methods and options by offering a authentication solution which is human-proof. What does this mean? The solution permits them to execute, enforce, and administer authentication processes and policies that require minimal human intervention. This lets them reduce administrative costs, and at the same time, removes the burden on the part of their IT department or team. In addition, security and compliance is often dependent on how people cooperate with each other. As a human-proofed authentication solution, DigitalPersona enables users to still achieve compliance and improve their security posture even if there is a lack of cooperation among the people involved in the authentication process. Truly, DigitalPersona eliminates reliance on traditional authentication methods as well as on people. But what are the authentication methods and options users can take advantage of using Digital Persona? The solution allows them to implement various types of authentication technologies, methods, and options. Among them are one-time password or OTP hardware and software tokens, smart cards, behavioral and biometric methods, mobile OTP, and Bluetooth and proximity cards. The enterprise authentication solution is so innovative, flexible, and dynamic in such a way that it provides users with the capability to select the right authentication methods and options so they can protect their business or mission-critical devices, applications, networks, and digital assets and apply the best ways to access them based on the needs of their organization, employees, end users, customers, and partners. This means they can choose the right authentication methods for the right persons and at the right time. DigitalPersona allows users to consider a wide range of factors when selecting and implementing authentication processes and methods. What’s great about this is that they can do this by taking into account risk and context. To illustrate this, they will be able to choose and apply authentication methods based on what information the person being authenticated knows, who that person is, what authentication technology or device that person have, what particular actions he or she can perform, where his or her location is, and how often that person is logging in and accessing the device, application, or network. Users can authenticate people based on their passwords, PINs, recovery questions, or other pieces of information they know about. They can also authenticate them according to their specific roles which is made possible through fingerprint scanning, facial recognition, or voice recognition. They can use smart cards, contactless keycards, proximity cards, or Bluetooth devices. Moreover, they can apply authentication methods based on actions that people are most convenient with like swiping. If they have mobile employees or field workers, they can use an authentication method that utilizes GPS or geofencing technologies. In case they have end users that are located in very far places, authenticating them through their IP address is an ideal authentication option. DigitalPersona, therefore, enables users to contextualize their authentication methods and processes as much as possible so that they will be able to deliver a frictionless user experience, and weigh all risks and security issues associated with those processes and methods. For example, one factor that they can consider is geo-velocity. This authentication actually combines geographical location and time. It takes into account the location of the person logging into the application, how fast he or she travels or moves from one location to another, and the combination of the two factors. A person who logged in at 2 p.m. in PST California, obviously, won’t be able to login again at 4 p.m. PST from the East Coast. This is because travelling that fast is very impossible. So if the same user is logging in, despite of the improbability of such travel event, access request from that user is denied. DigitalPersona can be implemented on various types of infrastructures, networks, and applications. It can run on on-premise and cloud-based environments, VPN networks, and virtual desktop infrastructures. It can even work on legacy-based applications. 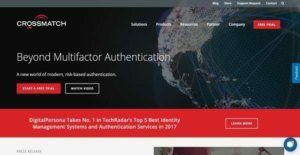 In addition, the authentication solution can be used for granting access to different types of users such as employees, vendors, partners, and customers. Thus, DigitalPersona is so powerful that it can cover a lot of infrastructures, networks, applications, and users. If you are considering DigitalPersona it may also be a good idea to check out other subcategories of Best Identity Management Software collected in our base of SaaS software reviews. There are well-liked and widely used solutions in each software group. But are they necessarily the best fit for your organization’s specific needs? A market-leading software product may have thousands of customers, but does it present what you require? For this reason, do not blindly shell out for popular systems. Read at least a few DigitalPersona reviews and mull over the factors that you wish to have in the software such as the price, main features, available integrations etc. Then, shortlist a few solutions that fit your wants. Try out the free trials of these products, read online reviews, get explanations from the seller, and do your investigation thoroughly. This profound homework is certain to aid you choose the most excellent software solution for your company’s specific wants. How Much Does DigitalPersona Cost? DigitalPersona’s SMB and enterprise pricing plan information is available only upon request. Please contact the sales department, and get your quote. We realize that when you make a decision to buy Identity Management Software it’s important not only to see how experts evaluate it in their reviews, but also to find out if the real people and companies that buy it are actually satisfied with the product. That’s why we’ve created our behavior-based Customer Satisfaction Algorithm™ that gathers customer reviews, comments and DigitalPersona reviews across a wide range of social media sites. The data is then presented in an easy to digest form showing how many people had positive and negative experience with DigitalPersona. With that information at hand you should be equipped to make an informed buying decision that you won’t regret. What are DigitalPersona pricing details? What integrations are available for DigitalPersona? DigitalPersona integrates with Panasonic’s Toughbook line of mobile computing software products. In addition, it can be integrated with your existing IT infrastructure, tools, and resources. If you need more information about DigitalPersona or you simply have a question let us know what you need and we’ll forward your request directly to the vendor.